Chef Shorty Tang Helped Introduce the U.S. to Sesame Noodles. His Son Is Bringing Them Back. 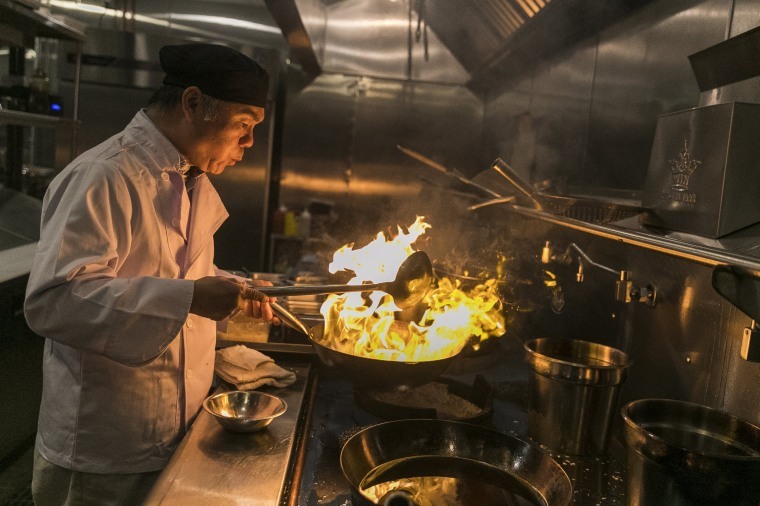 Hwa Yuan, a restaurant by a "legendary" chef in Manhattan's Chinatown, fed both celebrity and civilian alike. Now, after two decades, it has reopened. Steve McQueen, Paul Newman, Peter Falk. Chen Lieh Tang said he remembers them all, not just from the big screen but as patrons of his family’s Chinese restaurants, the last of which he shuttered in 2004. Now, a half century after its debut, the flagship where Tang’s late father entertained and fed celebrity and commoner alike is back. And so are the cold sesame noodles and Szechuan fare that turned Hwa Yuan on East Broadway in Manhattan’s Chinatown into a venerable New York institution. Chen Lieh Tang’s father, "Shorty" Tang, was born in the Sichuan province of China in 1922. He learned to cook at the age of 12 after running away from home and stopping at a restaurant because he was hungry, his son said. He worked there for eight years. Japan, at the time, had already invaded China, which was enveloped in its own internal unrest that pitted Communist against Nationalist. Facing defeat from Mao Zedong in the Chinese Civil War, Nationalist leader Chiang Kai-shek evacuated 2.5 million Chinese to Taiwan by 1949. Shorty Tang got to leave two years earlier, his son said. He lucked out because he knew how to cook. “All the rich, all the military, army, captains, all the generals, they all grabbed the chefs,” Chen Lieh Tang said. Earning his nickname in Taiwan for his height, Shorty Tang soon opened restaurants on the island and later made his way to the United States. He worked as a chef at a Chinese restaurant on Division Street, his son said, before opening Hwa Yuan in 1967. “He’s the kind of person who loved to cook for somebody,” Chen Lieh Tang recalled. Hwa Yuan attracted Chinese customers, some for banquets, to its first floor and basement space. But it also drew a big westerner fan base. In a 1973 review, New York Magazine called chef Shorty Tang "legendary." One of six children, Chen Lieh Tang had a front row seat to it all as a dishwasher, a position he took after arriving in New York in 1972, he said. His father taught him how to cook while in Taiwan and also schooled him on the famous secret sauces that dressed Shorty Tang’s dishes, like cold sesame noodles and Kung Pao Chicken. Then tragedy struck in 1976. Shorty Tang suffered a stroke and died at 52, his son said. “I had to quit school and come in and work very hard,” said Chen Lieh Tang, adding that he was enrolled at NYU. That hard work eventually translated into more than a dozen restaurants in New York City and also one in Westport, Connecticut, according to the Tangs. While Chen Lieh Tang said that the Westport location was a favorite of the late Paul Newman, one called Tang’s Chariot on East 53rd Street in Manhattan became a frequent haunt of the late Peter Falk’s mother, Tang noted. He added that she would eat there so often — three to four times a week — that Falk had a bill sent to him in Los Angeles to pick up his mom’s tab. The actor, known best for his role as TV detective Columbo, even showed up one time with his signature rumpled trenchcoat, Tang recalled. “And [Falk] had a glass eye, so my dad didn’t know if he was looking at him or not,” Tang’s son, James, added. Hwa Yuan closed in 1992, and the Bank of China moved in. By 2004, Chen Lieh Tang decided to leave the restaurant business altogether, he said. But the 65-year-old, who had a second career investing in property in Asia, emerged from retirement earlier this year. James Tang, 33, said his dad discovered that he missed the restaurant business. The three-story restaurant, which can seat up to 300 people, sits on property owned by the Tang family. They have a staff of around 30, a number that’ll likely grow, the Tangs said. Chen Lieh Tang is very much involved in the day-to-day of the business. He works seven days a week, he said, rising at 6:30 a.m. and turning down the next day around 2 a.m. As the main chef, he teaches others in the kitchen how to prepare the dozens of dishes on the menu. But he himself is solely responsible for mixing the sauces at both restaurants. Chen Lieh Tang said he’s hoping Hwa Yuan can be a boon to Manhattan’s Chinatown. The grand opening is expected within the month. So could this signal the start of a second Tang dynasty of restaurants? But his son had a different take. CORRECTION (Oct. 30, 11:25 a.m. ET): An earlier version of this article misspelled the name of Hwa Yuan's owner in two photo captions. He is Chen Lieh Tang, not Chen Lien Tan.